Denver, CO. – The Raiders traveled to Denver and laid an egg in the first half. Oakland battled back in the second half fueld by two Derek Carr Touchdown passes, and Khalil Macks‘ five sacks of Brock Osweiler including one in the end zone for a safety. Oakland (6-7) upset the Broncos(10-3) on the road 15-12. The Raiders trailed at the half 0-12 as Oaklands’ defense held the Broncos to four first-half Brandon McManus field goals. The Raiders offense struggled on all fronts. They only ran 15 plays the entire first half for a total of -12 yards. Derek Carr completed just 12 of 29 passes for 135 yards. But two of his throws were for touchdowns, and the Raiders (6-7) beat the Broncos for the first time since Sept. 12, 2011 despite being held to minus-12 yards in the first half — the worst performance by a team heading into halftime in nearly a quarter-century. The Raiders drove 80 yards to open the second half and trim Denver’s lead to 12-7 when Carr threw an 11-yard pass to Seth Roberts. Mack said the Raiders knew they had a chance when they held the Broncos out of the end zone four times in the first half. safety pulled the Raiders to 12-9 when Mack sacked Osweiler in the end zone and Broncos guard Max Garcia recovered the loose ball. The Raiders held the Broncos to three field goals on three red zone trips in the first half and did not allow Denver back into the red zone for the entire second half. The Raiders held the Broncos scoreless in the second half for the first time since Oct. 15, 2006, a 3-13 loss. The last time the Raiders did so in a win was Nov. 22, 1992 (24-0). The Raiders held the Broncos to 34 rushing yards, giving the Broncos 77 total rushing yards against the Raiders this season. That marks the Broncos’ second lowest season total versus the Raiders (51 yards in 1972). Along with 1963 (96 yards), this marks the third time in team history the Raiders allowed less than 100 rushing yards to Denver in a season (excluding the strike-shortened 1982 season). The Raiders allowed 25-or-fewer rushing yards in a first half for the fourth time this season and the second time in three weeks (also Nov. 29 at Tennessee). Oakland long snapper Jon Condo recovered Emmanuel Sanders’ muffed punt at the Denver 11 early in the fourth quarter, but he injured his right shoulder in the pile. He was in the locker room getting it looked at when Carr threw a 16-yard touchdown pass to tight end Mychal Rivera to put Oakland ahead 15-12 with 14:26 remaining. Without Condo, the Raiders went for 2 and Carr threw an incompletion, leaving the margin at a field goal. Brandon McManus clanked a 49-yarder that would have tied it off the left upright with 10:22 remaining. Sebastian Janikowski then missed a 43-yarder with 5:07 remaining, giving the Broncos good field position at their 33, but Davis had his big drop on fourth down after that. The Broncos couldn’t get into the end zone in the first half despite 224 yards of offense, settling for four field goals from McManus, each one shorter than the previous — 41, 35, 29 and 21 yards. Oakland’s lack of production in the first 30 minutes was the lowest figure by any team in the first half since Nov. 1, 1992, when the Chargers held the Colts to minus-5 yards. 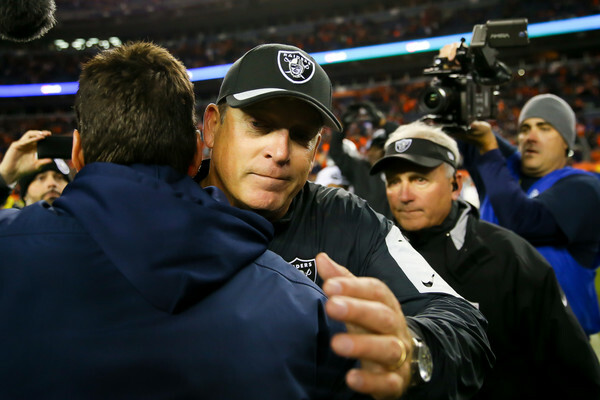 The Raiders defeated the Broncos 15-12 to snap the team’s eight-game losing streak against Denver. The team’s last win against Denver came on Sept. 12, 2011. For the first time in the Raiders-Broncos series history, the Raiders did not allow the Broncos an offensive touchdown in a season. It marks the sixth time the Raiders held Denver without a passing touchdown (last: 2002) and the eighth time without a rushing touchdown (last: 1993) in a season series.